WGM Mirjana Medic won a photo finish final to take the first place at the Mediterranean Flowers chess tournament in Rijeka. Medic collected a total of 7,0/9 points, the same as the second WGM Pokorna, and it was the second tiebreak (Sonneborn-Berger) that separated the two players. 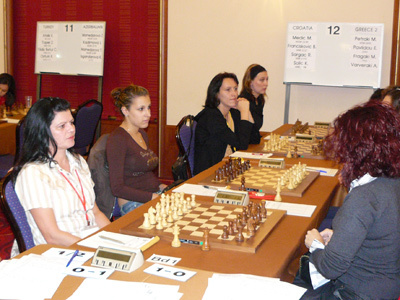 The whole tournament WGM Regina Pokorna was leading the event, closely followed by WIM Adriana Nikolova and WGM Mirjana Medic. A penultimate round of multiple draws left the final round wide open. Pokorna was the leader with half a point over Nikolova and Medic, who had a direct match. Regina Pokorna settled for an early draw against Iulia Ionica, as she did not want to risk with the black pieces her position. However, she did not expect the dramatic turn of events. Nikolova blundered a piece in the endgame, and despite struggling for a few moves could not recover. Mirjana Medic took the victory with black and thus the tournament title on tiebreak. Sophie Millet, who has just become an IM jumped on the opportunity, won against Sara Jacimovic, and clinched the third place.